Office Furniture Deals provides discount stools for every occasion! Our selection of cafe stools, drafting stools, bar stools, and physician stools is the absolute best online. Shop comfortable ergonomic stools today from popular brands like Global Total Office, OFM, Flash Furniture, and more. 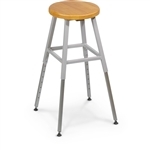 All of the office stools for sale online at OfficeFurnitureDeals.com include free shipping for added value. Purchasing multiple stools for your restaurant, school, or business? Contact us today at 800-456-6746 for bulk discount pricing and additional savings. Don't settle for less when you can have the best! Choose Office Furniture Deals for office stools today and save up to 60% off retail. Your Price: $296.00 *Call for Additional Savings! Your Price: $230.99 + Free Shipping!